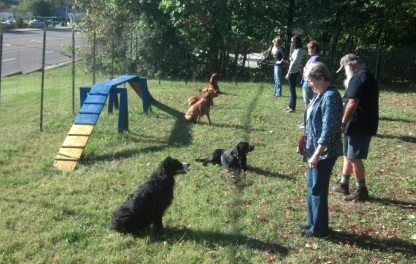 Intermediate Foundation builds on what has been learned in the Basic Class, and also covers some new skills: Wait, Settle, Watch, Front, Stand, Back Up, plus distraction work with Stay, Heel, and Recall. This class is great for those who have already completed Basic Class and have a strong handle on the basic commands. This is ideal if you want to continue further for pre-therapy training, keep a high energy dog (or person!) active and stimulated, or simply have more activities to do and time to spend with your dog in a fun and safe environment.